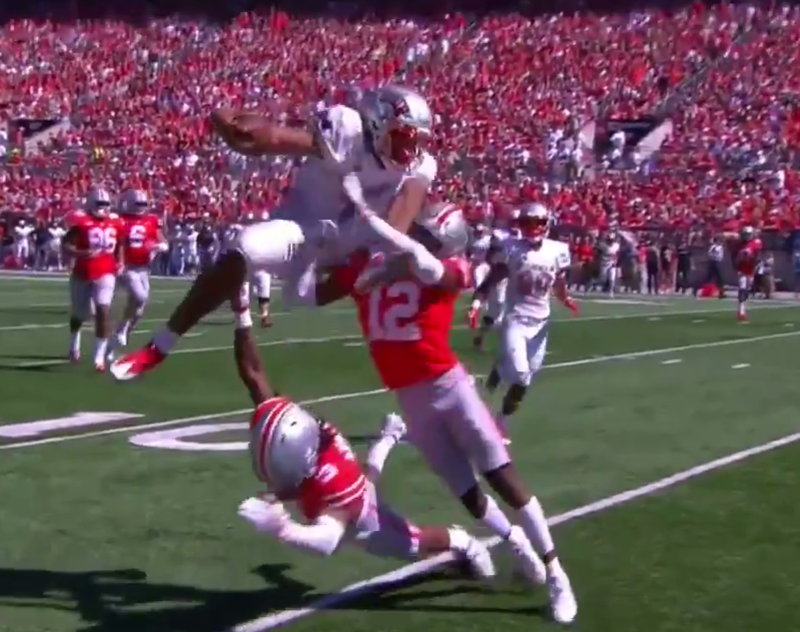 COLUMBUS, Ohio – After opening the season with a stunning upset loss to FCS Howard and rebounding with an impressive road win over a future FCS school in Idaho, UNLV finally got to play a game with the big boys Saturday. Tenth-ranked Ohio State (3-1) jumped out to a 37-0 lead in the first 21 minutes and the Buckeyes set a school record with 474 passing yards and a Big Ten record with seven different receivers scoring touchdowns en route to a 54-21 victory before a crowd of 106,187 at Ohio Stadium. Call it a win-win for the two schools. Tony Sanchez’s Rebels (1-2) took home a much-needed payday of $1.3 million for the beat-down while Urban Meyer’s rebuilding Buckeyes got a nice tune-up before returning to Big Ten play next week at Rutgers. Meyer substituted freely in the second half. Senior quarterback J.T. Barrett, under the microscope for his sub-par play in a 31-16 loss to Oklahoma on Sept. 9, completed 12-of-17 passes for 209 yards and five touchdowns before giving way to freshman Dwayne Haskins, who finished 15-of-23 for 228 yards and two touchdowns. Sophomore Joe Burrow, sidelined for over a month with a broken bone in his hand, came on in the fourth quarter and was a perfect 4-of-4 for 37 yards. Ohio State finished with 664 total yards, including 95 yards rushing on 14 carries by freshman running back J.K. Dobbins, who didn’t play in the second half after the Buckeyes built a 44-7 halftime lead. There were some positives for the Rebels. * Junior running back Lexington Thomas rushed for 84 yards on 12 carries and scored two touchdowns, including a 55-yarder in the third quarter. * Sophomore DB/LB Javin White scored the game’s final touchdown on a 65-yard interception return off Haskins and also forced a fumble at the UNLV one-yard line to stop another Ohio State drive. * Freshman quarterback Armani Rogers, swarmed by a strong Ohio State pass rush that produced four sacks, finished a respectable 11-of-19 for 88 yards but was also intercepted twice. He also had a highlight-reel scramble down the right sideline where he tried to leapfrog a pair of Buckeye defenders. And the Rebels actually won the second half, 14-10. The question is how costly was the loss. Starting wide receiver Kendal Keys, who had three catches early in the game, and starting center Zack Singer were among those who departed early with injuries. The Rebels return home to open Mountain West play against San Jose State on Saturday night at 7:30 p.m. at Sam Boyd Stadium. “Saw a lot of growth today and it’s time to rally the troops and get ready for conference next week,” Sanchez said. Is it speed you want in your receivers?